Following the UN Panel on «Freedom of Religion or Belief: Toward an Agenda for Implementation» Dr. Liviu Olteanu, the Secretary General of the «International Association for the Defense of Religious Liberty (AIDLR)» reiterated his support to an EU agenda for implementation regarding freedom of religion or belief for all people. Photo: H.E. 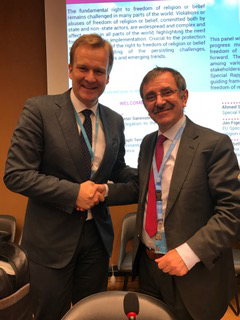 Ambassador Peter SORENSON, Head of EU Delegation to the UN in Geneva, and Dr. Liviu Olteanu, Secretary General of the AIDLR at the Palais des Nations in Geneva.